That Alinda and Coco Ramos are Unity’s most romantic couple was evident when I asked them “Who inspires you?” After a short moment of silence, they pointed to each other and said “S/HE DOES!” That comment was followed by a short laugh and a loving hug. It was a light moment that revealed their love, gratitude and commitment that is at the heart of who they are, personally and professionally. Appropriately, it was Valentine’s Day weekend (2019) when I interviewed them at their home near Orlando. Our interview and more about their life and work is here. The 27 clips from the interview have been somewhat rearranged to follow three themes that emerged: their experience in launching a successful ministry, how to deal with health challenges and secrets of loving relationships. But the grand themes of their life, and the blessing their story brings to us, are, as I said, love, gratitude and commitment. Their love for each other and for the people they serve is evident in the opening clip where Coco explains “it did not happen as I guess it was supposed to happen, but she had her ordination and I became a licensed teacher ... eventually I was ordained through field licensing.” For Coco and Alinda, neither person goes first. Where they go they go together, and as you will see in the final 3rd of the interview, they consider themselves to be true soulmates—a couple who have been together several times in other lifetimes. In the final clip, we have Coco at the piano, joined by Alinda, singing their song. Whew! If the opening clip and the final clip are bookends to the story of Alinda and Coco’s love, most everything in between is a testimony to the gratitude they have for all things in life. Before the camera got turned on, I learned that they are cursillistas. If you’re Catholic, you might know what that means. If you aren’t, just know that, to Coco and Alinda, all things are full of “the colors” of life. Their experience is mystical, full of the knowledge of God’s presence and grace. They radiate thankfulness—to Norma Rosado, Paul Hasselbeck, Richard Mekdici, Michael and Faith Moran, their Religious Science and their Adventist friends and to each other. That Coco is facing a life-threatening health challenge is, to them, “an adventure” they take together. What matters to them is not the outcome but rather “how we live it.” All too few people live the 5th Unity principle as well as Alinda and Coco Ramos. But most important is their gratitude to God, which leads to the commitment they have toward ministry and their service as Unity ministers. Alinda shares how they prioritize life—God is number one and they, individually, are number two. Alinda and Coco, as a couple, are number three and their children are number four. Ministry comes in later. If it is correct that “order is heaven’s first law” then this way of ordering their life and their work just may be Coco and Alinda’s secret sauce for successful marriage and ministry. You see their children and their congregants don’t get Alinda and Coco’s love—rather they get God’s love—fully and freely channeled through Alinda and Coco. Coco and Alinda have known each other in this lifetime over fifty years and they have been married 47 years. Fifteen years ago they launched the 3rd Unity ministry in the Orlando area. Their ministry has now shifted to an online process to allow time for Coco’s healing. Do you see how commitment to God and the way Alinda and Coco prioritize life is playing out in their life and ministry? Can we see how God is leading their work? If so, then we have a glimpse into the secret sauce of not just successful ministry, but of how to be romantic about all of life. Ministers Alinda and Coco Ramos seemed destined for shared spiritual service from the time they met in 1966. Since then they have worked together as church volunteers, traveled around the world with their music ministry, and worked together at Unity Village, Missouri, central offices of the Unity movement. Alinda and Coco Ramos were married in 1972 and have two daughters, Alinda and Lillian. Alinda and Coco discovered Unity in 1978 in San Juan, Puerto Rico, USA. In 1981 the couple moved to the mainland and settled in Orlando, Florida. In 1997 they answered a call to Ministry and moved to Missouri. Alinda was ordained a Unity Minister in 2001. Coco became a Licensed Unity Minister in 2004 and was ordained a Unity Minister in 2008. Alinda holds a Bachelor of Arts in Education, a Master of Science in Computer Education, and a Specialist Degree in the Teaching of English to Speakers of Other Languages. She also is a graduate of the Unity Institute, formerly Unity School for Religious Studies. Coco Ramos holds a Bachelor of Arts in Education and has completed the Personal Development and Leadership tracks at Unity Institute as well. During his time in Missouri Coco was the Executive Producer of the Multimedia Department at Unity. He is a recording artist with five compact discs to his credit. 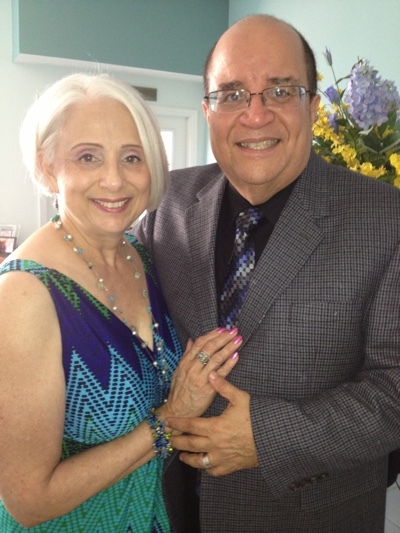 The Ramos couple has been featured as presenters at National and International Conferences for Unity Ministers. Supported by their love for each other and inspired by their understanding of God’s love, they have together committed their lives to the Unity Ministry. Here are some links for connecting with Alinda and Coco. Coco's Facebook page; Their ministry's Facebook page; Facebook: CocoIsASurvivor. If you have been blessed by the content of this page or the work of Revs. Coco and Alinda, why not consider a tithe to their ministry? or to a GoFundMe account to help with their health expenses? 02 How was your experience in ministerial school? 06 What did you do after graduation? 14 Health challenges are about "how we live it"
20 How do you stay so romantic?